Good grain storage 4 x A5 pages leaflet highlights the proper use of metallic silos and their benefits. Produced at a write-shop in Kenya facilitated by ASHC. 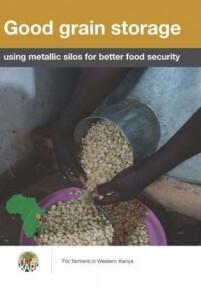 The good grain storage poster covers how to use metallic silos and benefits of metallic silos. Produced at a write-shop in Kenya facilitated by ASHC. Shamba Shape-Up – storing maize is a 1-minute, made for television, film. Made by Mediae supported by ASHC.